Our Tuesday and Thursday services of Midday Prayer are an opportunity to gather as a community for meaningful worship in the midst of the day’s work, and for those leading to become familiar and comfortable with this form of leadership. While most services are Christian, we also plan for opportunities for the whole community to share in Muslim prayer and Buddhist meditation. Christian Midday Prayer is based on the liturgical tradition of Daily Prayer. These services are not intended to be simply an abbreviated version of a Sunday worship service. 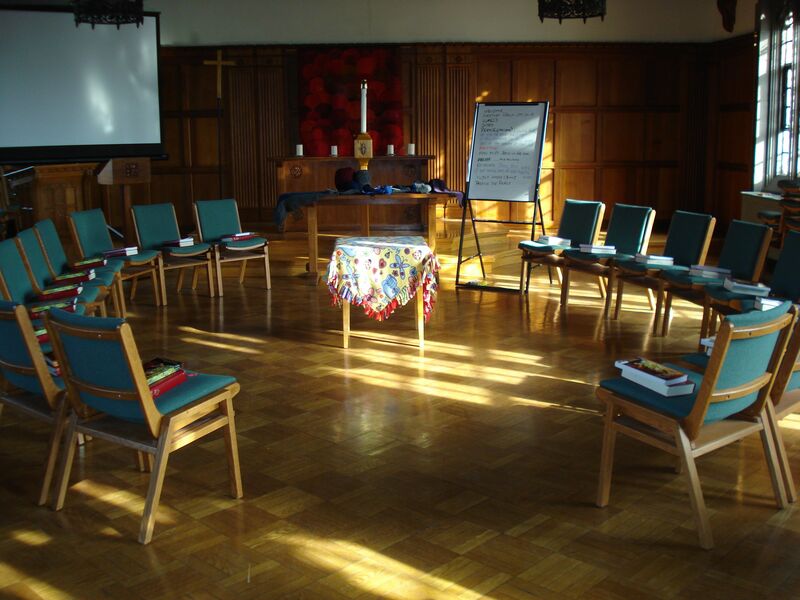 Sunday worship is rooted in the traditions of Word and Table – preaching and sacrament (Eucharist), while Daily Prayer is rooted in the contemplative traditions of the Daily Office, emphasizing prayer, psalmody, readings and silence. For our purposes, services of Midday Prayer are intended to be simple, brief services (of no more than 15 minutes) for prayer, music, scripture and reflection. It is important to incorporate moments of silence into the service. While these services are intended to offer participants a time of pause for reflection and prayer, connection and worship, they are also an opportunity for those so interested to exercise creativity and employ approaches which may be new or different in a safe environment. Wednesday worship most frequently (but not always) takes the form of a Christian service of Word and Table – i.e., including the Sacrament of Holy Communion, Lord’s Supper or Eucharist. While our norm is Eucharistic, reflecting ecumenical foundations of Christian public worship, worship planners are free to invoke other liturgical models and traditions in relation to the relevant texts, concerns and guests. In addition, other rituals (e.g., footwashing, prayers for healing, other symbolic actions, etc.) may be appropriate to the occasion. An Emmanuel College Lectionary (an optional list of daily scripture readings) provides texts of scripture to guide our planning. We also plan for opportunities for interfaith worship. 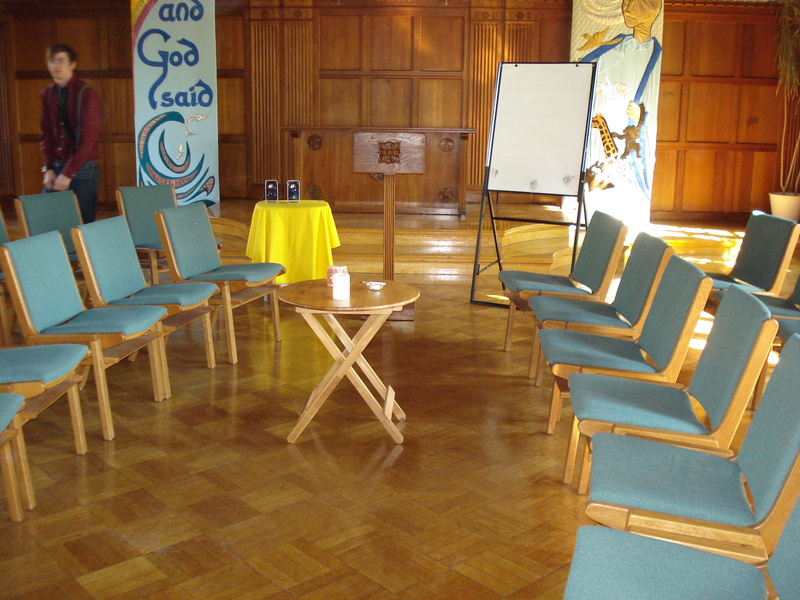 The chairs are in a clamshell formation around a long central table, and a large wooden cross is visible beside the lectern. The whiteboard with service order is at the top of the steps behind the lectern. 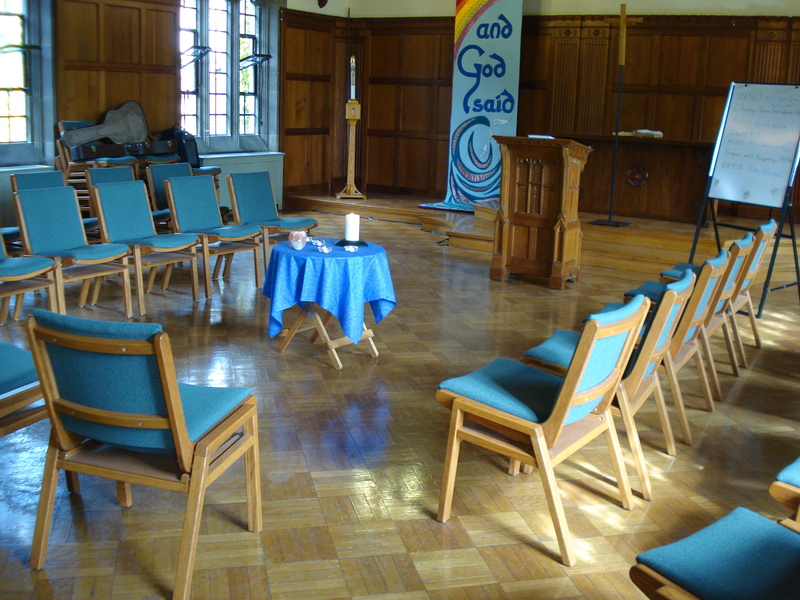 Here we see an example set up with chairs forming three sides of a square, around a low circular table with different heights of candles. 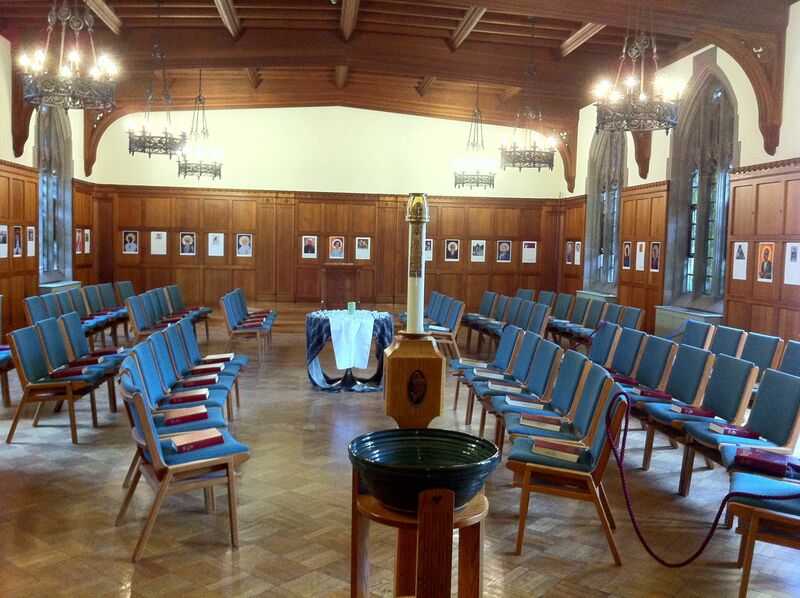 The cloth on this table is blue with silver stars (there are a number of clothes in different liturgical colours). Notice the whiteboard with service order next to the lectern. 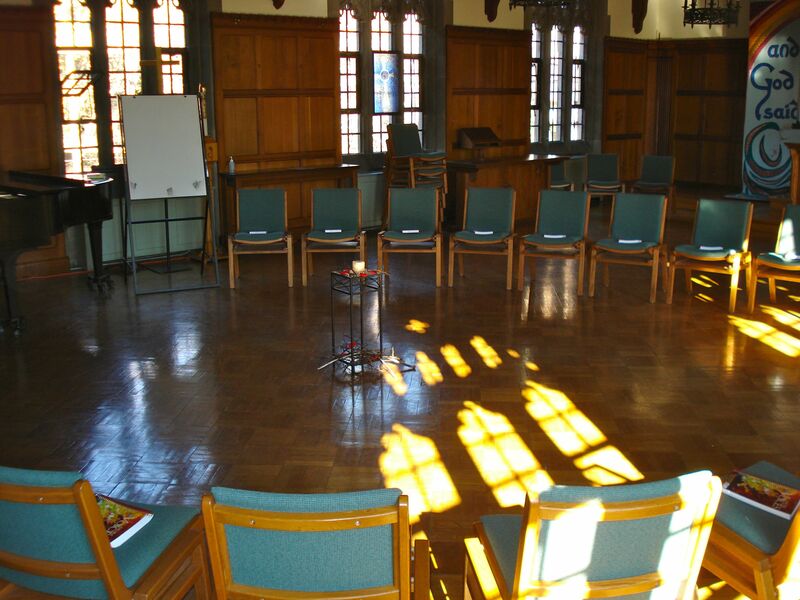 The chairs are in a clam shell formation, with a lectern at one end and a music stand at the other, so that the service leadership moves between them. Next to the lectern, a small table has been set up for speakers connected to a computer, behind the cloth, for the gathering music. 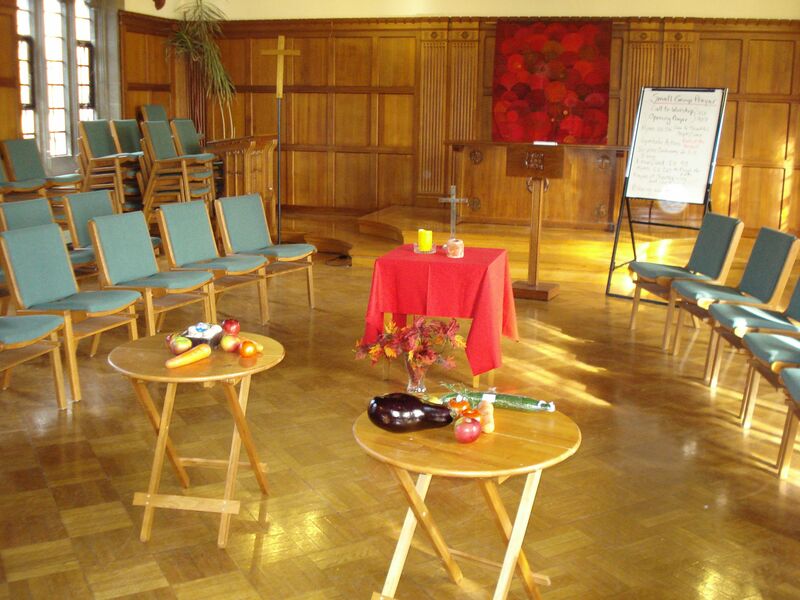 In this set up, the chairs are arranged in a circle, with a small symbolic centre arrangement – poppies and dried twigs that express the themes of Remembrance day and moving into winter. 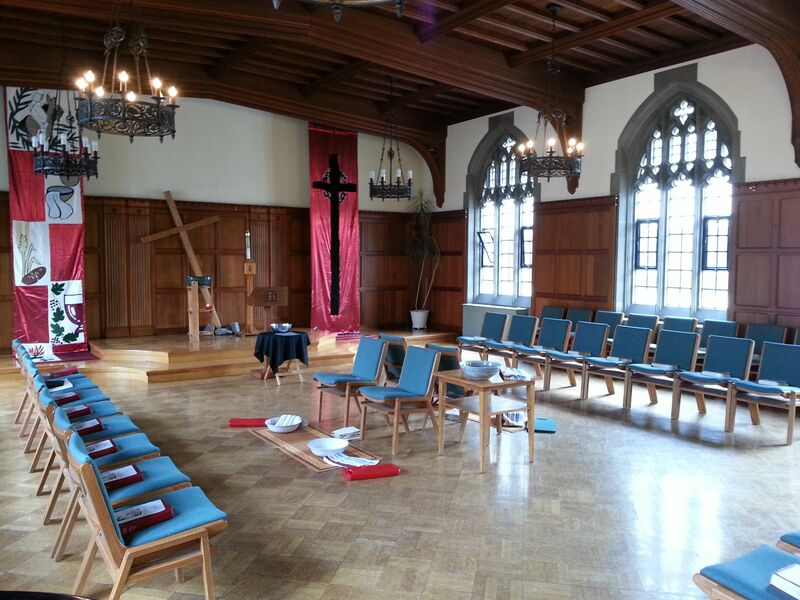 Notice the hymn books set out on the chairs, ready for people to arrive. In this set up, three small tables have been used in the centre of a clam shell chair set up. The produce has been presented symbolically during the service, reflecting the harvest theme. Note the use of colour carried through the wall hanging, table cloth, and arrangement of autumn leaves. In this setup, a circle is modified to include space to enter the circle, and incorporate a table with symbolic items (in this instance yarn). The advantage of a circle setup is that everyone is included in a single row, creating a sense of closeness. It’s also an advantage if objects are being passed (as took place in this service as the baby blanket was tied together by each person present). This image shows the difference in scale between setups for Midday prayers and Wednesday worship, and in particular the setup used for a footwashing service. In this setup, symbols of the cross and water take central place during Holy Week. Chairs are positioned along three sides of a square, allowing the focus to be at the centre. 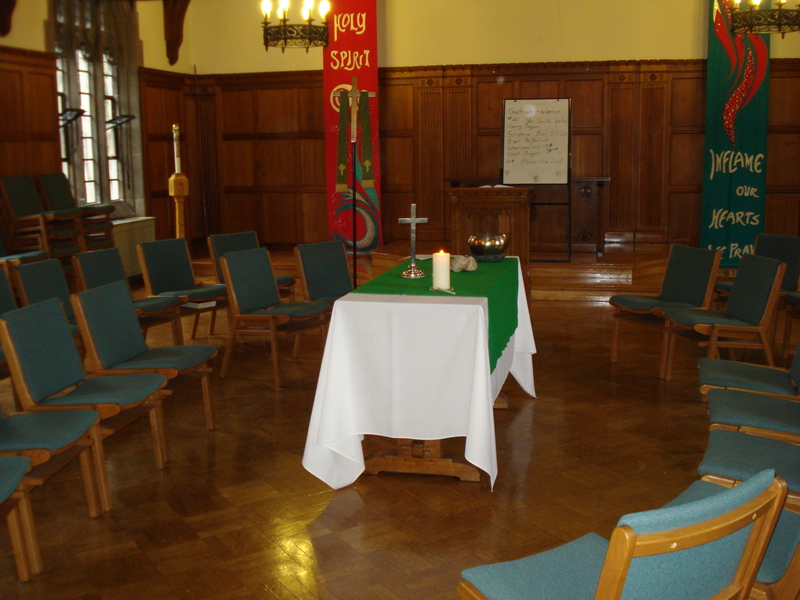 This image shows a chapel arrangement for an All Saints Service, notable for the space to move around and the multiple points of access for the central altar table where candles are lit. The long axis also encourages direct engagement between participants more than a traditional front-facing setup. 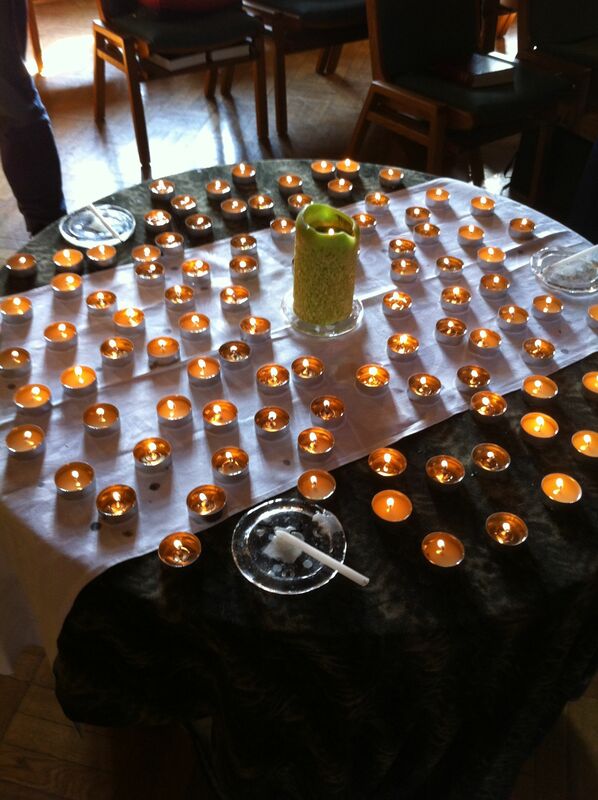 The table setup for an all saints or other candle-lighting service. You may want to model lighting candles from the center out, in order to encourage safety.